Casey Design/Planning Group Inc. directed all facets of this large renovation and restoration project, including all architectural and interior design stages. This family of six had been living at this central Toronto home for thirteen years. In this stone and brick house from the turn of the century that had been poorly renovated in the 70’s, there was a clear disconnect between it's past elegance and it’s present, worn condition. Original oak banisters and paneling were still there, but the bathrooms and the kitchen were outfitted in cheap, melamine cabinets and tiles. Initially, the clients pointed out their dissatisfaction with the following: the small foyer had shoes and coats strewn everywhere due to no storage, the original kitchen design had only 4 linear feet of counter space, and the hallway desk had files piled everywhere. The owners had a passion for baking and cooking but there was no room for both in their tiny kitchen. In desperation for more storage, an unused servants staircase was used for pantry storage, but was not easily accessible. The family room was not open to the kitchen and had a narrow 28" wide doorway, blocked by the kitchen table. Bookshelves were bending under the weight of their vast library, the bathroom cabinet doors were falling off their hinges, closets were spilling out, and the only access to the small laundry room was through the powder room. We added onto the back of the house and relocated key services. We re-directed the traffic flow away from the front entrance, thereby creating a formal entrance, and added a mudroom to the side of the house for everyday use. In the living room we relocated the fireplace to make it the focal point of the room, with a large inviting archway off the central hallway. The centered fireplace allowed us to create two new archways into the conservatory, resulting in additional light to the once dark living room. The client was loath to remove the existing, oak paneling in the living room, but we felt that the proportions were poor and gave the perception that the ceiling height was much lower than the actual 9 feet. We recommended lower, oak wainscoting and large-scale plaster crown moulding and a new, full height, oak mantel. In the conservatory, the original armature for the ceiling was discovered when we opened up the space. This inspired us to raise the entire room ceiling to match the living room ceiling height. An authentic copper clad skylight, made by the same company that restored the conservatory at Toronto’s Allen Gardens, transformed this room into a sun filled piano room with new French doors opening to the side garden. For the kitchen design we separated the two functions - baking and cooking. The family room opposite the cooking zone became the most popular space in the house, illuminated by four sets of French doors facing the rear garden and spanning the full width of the back of the house. The interior architecture of the second floor was altered to give the two children’s bedrooms an ensuite bathroom, and the master suite had a separate walk-in closet and ensuite bathroom, with a sitting area. The laundry room was relocated from the first floor. 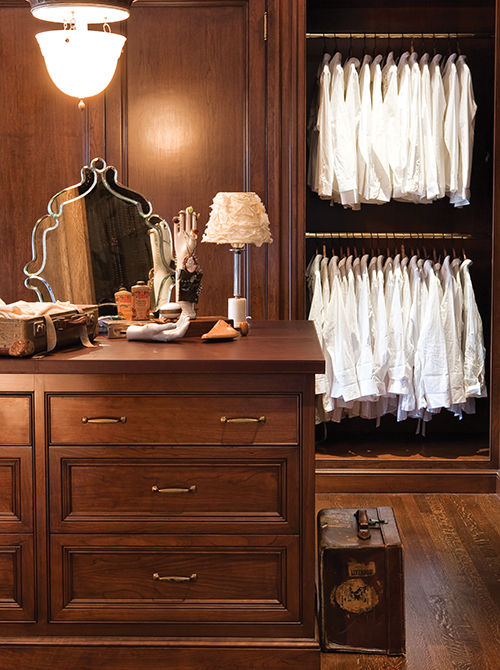 In the master bedroom, storage issues were addressed with a separate walk-in closet featuring walnut cabinetry and a leather top island, convenient for packing and laying out accessories and clothes. 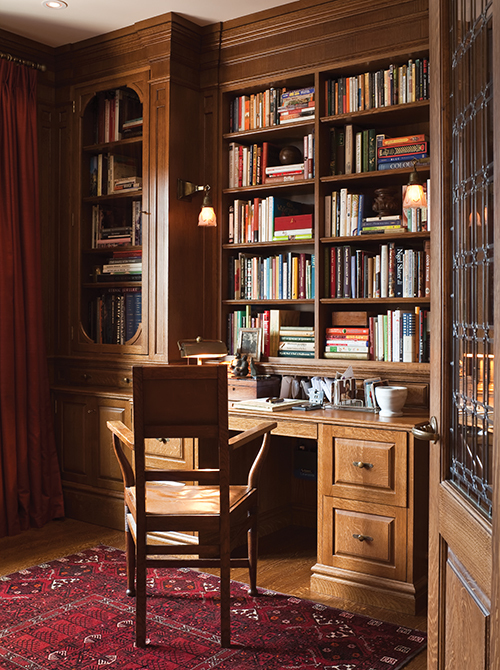 The location of an existing second floor study was kept and this room, in addition to the main floor library, housed the client’s extensive library. Inspiration – the traditional interior design and architecture references the home's Edwardian Period, implemented with a high level of craftsmanship. Flooring – original, terrazzo floor in the conservatory was restored and became an inspiration for the custom designed, marble, mosaic floors throughout. Kitchen design – The heart of the home, “the knock out kitchen” according to House and Home magazine, was planned with a separate baking centre/pantry, and has a European working kitchen atmosphere, with copper pots and cooking condiments out in the open. In the baking centre, "the artful assemblage of materials includes a tile backsplash that feels lifted from a Vermeer painting, dynamic floors, copper accents and green marble countertops.” Opposite the cabinets we installed a wall of book storage for the client’s vast collection of cookbooks. Custom designed, period inspired, leaded glass doors make a beautiful entrance to the second floor library, and allow for more light to enter from the stair landing. The leaded glass detail was carried throughout the house and used in the front entrance, window details, pantry and on a second floor landing to obscure the neighbour’s house. Custom millwork in all the rooms - in the main floor hallway the white oak paneling was redesigned to create the perception that the ceiling was higher and to avoid the feeling of a dark and heavy space. 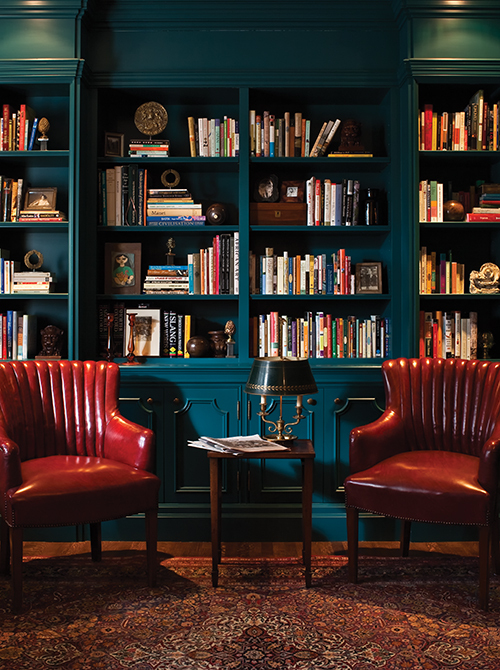 The main floor library was painted an exuberant turquoise, and featured curved paneling. The kitchen/family room incorporated a walnut stained coffered ceiling, and all the cabinets were designed to create an old world feeling. 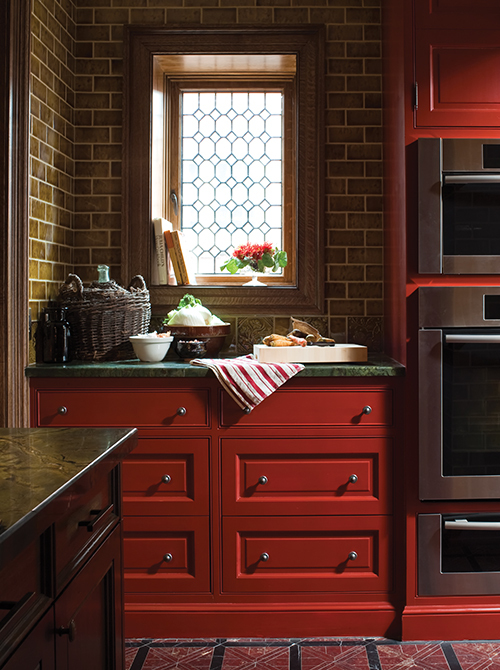 The pantry was painted a rich russet red; with lower cabinets were stained walnut. The second floor library was paneled in quarter-sawn, white oak to match the original paneling on the first floor, while the master ensuite featured a walnut vanity with stepped back pilasters. New, white oak doors, casing, paneling and custom plaster crown mouldings were designed throughout to maintain the heritage character of the home. 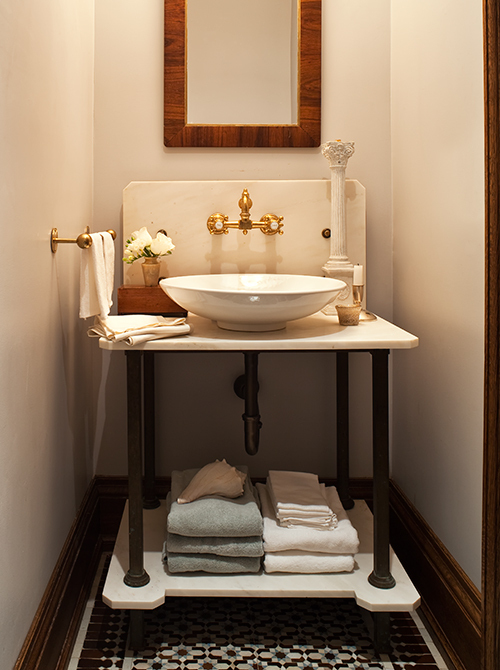 Antique lighting and period antique brass hardware were used to evoke an authentic period house. 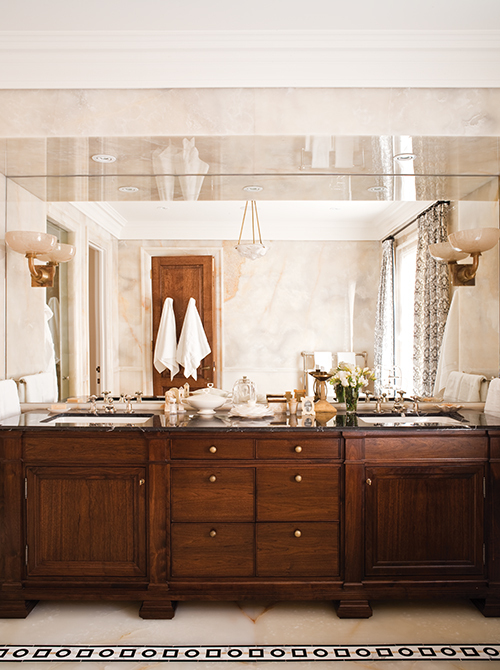 The National Post writes of the master ensuite: “The room’s walls and floors are onyx, with a custom-designed marble inset of alternating circles and squares spooling around the perimeter. 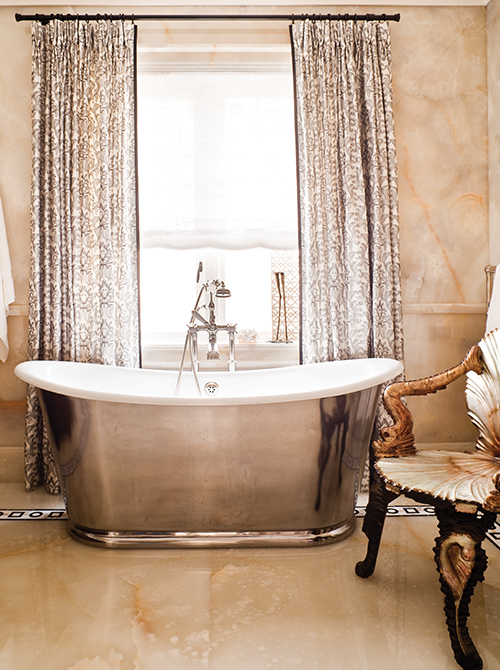 Silk draperies form a backdrop for a shimmering pewter-faced tub, next to an over the top shell chair with arms shaped like fishes.” The very delicate onyx was painstakingly carved to create chair rails, baseboards and casings for a seamless effect." The daughter’s room was designed to reflect her interest in fashion, and the son’s passion for collecting was addressed with custom metal shelving and quirky vintage storage cabinets for display in his room. Exterior - stonework was added to enhance the proportion of the bay windows while an existing portico (not original) was replaced with a new, limestone portico, and copper flashing was added to the bay windows and the exterior of the new conservatory skylight. In recognition of the historical restoration and contemporary upgrading of this original Edwardian home, ARIDO (The Association of Registered Interior Designers Association Ontario) awarded Casey Design/Planning Inc. its 2012 Residential Restoration Award of Merit.